1:00 to 5:00 pm at Ranch View Elementary School in Naperville, IL. The goal of this event is to bring together children from a wide range of cultural backgrounds to focus on the common between children and to use that unity to benefit our community in Chicago and surrounding areas. In order to make this event happen we have several options for sponsors. As previous years we will feature our sponsors on a banner/poster next to the stage. We will post the sponsors on TACA Facebook and Websites. You can also send and/or bring your flyers/business cards to exhibit on a sponsorship table at the event. In addition, the Platinum, Gold, Silver sponsors business company logos will be published on our website as ICD Sponsor for one year(platinum), six months(gold) and three months(silver) time period respectively. The attendance to this event in the past years is between 400 and 600 people Thanks to all your support!! 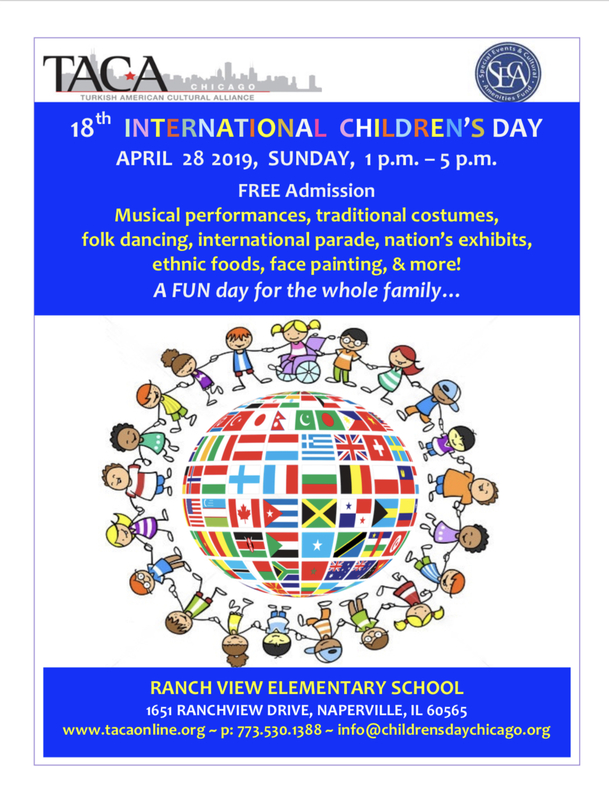 Please join us in making International Children’s Day an exciting cultural event! mail to “TACA 3845 North Harlem Avenue Chicago, IL 60634”. Thanks in advance for your support to this event.